The Swarovski Database by Warner’s Blue Ribbon Books on Swarovski has a few new figurines added since the first of the year. Tom and Jane Warner, the database owners, believed Swarovski crystal collectors would want to have access to the newest SCS member issues that will also be in the next Swarovski book release. Warner’s Blue Ribbon Books on Swarovski is diligently working on update information for their 2011 printed Swarovski books. Research for the 2011 Swarovski Value (ERVs) is being conducted this month. Also, all the 2010 Swarovski crystal introductions are being added to the books, as well as a few 2011 introductions. 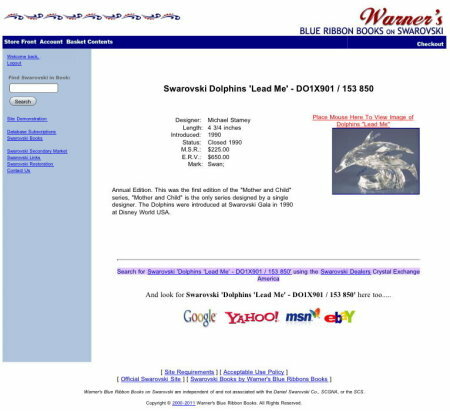 Once the spiral books have gone to print, Warner’s will begin updating the online Swarovski Database which is hosted at http://www.wbrbonline.com/ . 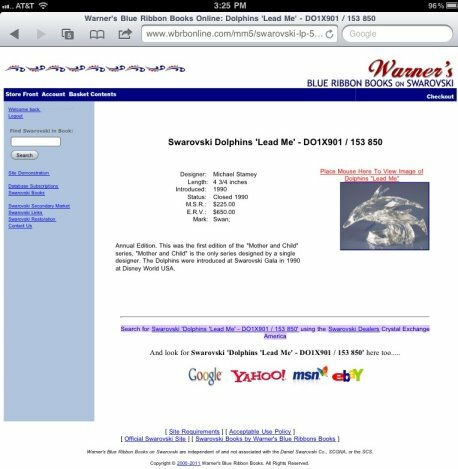 This Swarovski Database has over 2800 Swarovski figurines which can be accessed totally FREE. The free queries have limited information for the items. To view pictures and complete information, Swarovski collectors can purchase a one year subscription to the database. One of the nice features about purchasing a subscription is that current Swarovski crystal pictures and statistics are available 24/7 at a collector’s fingertips, at home or anywhere in the world. The site can be viewed via iPad, laptop, or computer at home.